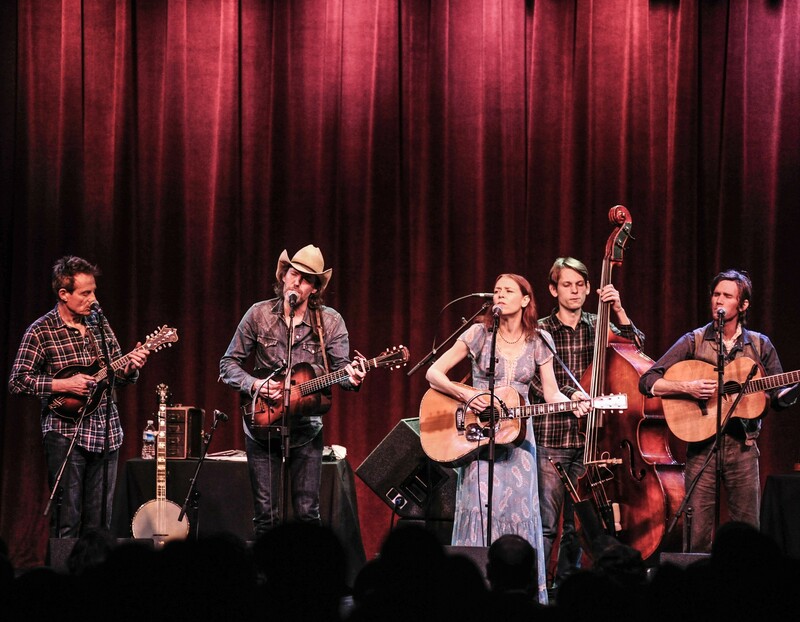 Dave Rawlings and Gillian Welch are songwriting royalty among Americana music fans, with two decades of recordings and tours as a duo — mostly under Welch’s name — helping them build up an incredible amount of good will. Surround them with an amazing band, as happened Tuesday at Spokane’s Bing Crosby Theater, and you have the makings of an unforgettable night. The only person on stage who didn’t sing lead at any point was the man whose introduction elicited the loudest roar all night. John Paul Jones, most notably a former member of hard rock pioneers Led Zeppelin, sang plenty of harmonies with the others, while his mandolin solos mesmerized regularly on songs like “To Be Young (is to Be Sad, is to Be High)” and a scorching cover of Bob Dylan’s “Queen Jane Approximately” late in the show; he and Rawlings traded rapid-fire licks throughout that one, with Rawlings even looping in a few bars of the Allman Brothers’ “Midnight Rider” along the way. In a show full of highlights, it’s hard to pick out favorite moments. The obvious joy on display, led by Rawlings and his huge grin and self-deprecating between-song banter, was infectious. It’s hard for me to remember seeing a band smile so much during a show. The crowd regularly burst into applause at particularly strong instrumental passages, even mid-song, and every break between tunes was met with whoops and hollers. Rawlings kicked off the proceedings with “The Monkey and the Engineer,” a Jesse Fuller tune the Grateful Dead was fond of, followed by an as-yet-recorded tune, “Candy.” Watson took over for an old-time mountain song, “Dry Bones,” before Welch took lead for the first time on a harmonica-driven “Wayside Back in Time” from her Soul Journey album. Next came a transcendent run of songs highlighted by the Machine’s first-ever performance, according to Rawlings' introduction, of Bob Dylan’s “As I Went Out One Morning,” the aforementioned “To Be Young (is to Be Sad, is to Be High),” which Rawlings wrote with Ryan Adams, and Watson’s take on “Keep It Clean.” From that point on, the crowd was fully engaged, clapping and stomping along with the fast tunes, falling silent during the ballads. The latter stages of the show were heavy on cover songs. “I Hear Them All,” a song Rawlings co-wrote with Old Crow Medicine Show, was mashed up with a stirring “This Land is Your Land.” The epic combination of Bright Eyes’ “Method Acting” and Neil Young’s “Cortez the Killer” stretched a good 10 minutes, and I would have happily taken more. Dylan’s “Queen Jane Approximately” closed down the second set, leading to a thrilling encore of Led Zeppelin’s “Going to California,” Jones’ mandolin leading the way while Rawlings tackled vocals. Welch’s “Miss Ohio” satisfied a woman who’d been shouting for it all night before the band closed it down with “The Weight,” a song that’s probably been covered a few too many times, but never by any group of musicians more skilled than the Dave Rawlings Machine.